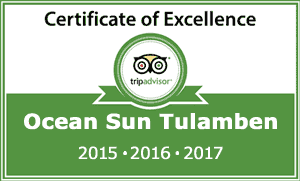 We offer individually guided tours to all destinations in Bali. We can easily reach the area around the volcano Batur. 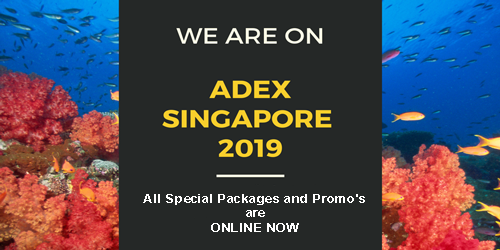 Furthermore, the region around Bedugul, Lovina and Ubud is a popular destination which we explore on one-day excursions. Activities like rafting, trekking, squad, golf or climbing parks are possible. 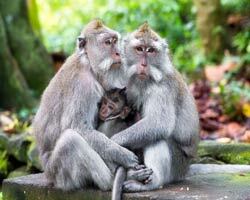 Lovers of wildlife will get their money’s worth in various parks around Ubud. Our favorite there is the Bali Bird Park. Of course, we have to mention the temple cult of Bali. Culture lovers are in excellent hands on Bali. You can visit countless temples. Ubud, a cultural center, is popular with art lovers and offers Balinese artwork in many markets. 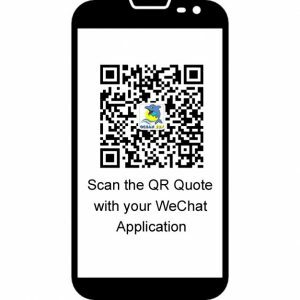 Below you will find some descriptions of interesting destinations from various regions. After a 30 minute drive from the Ocean Sun Dive Resort, we reach the touristic little known tree house. 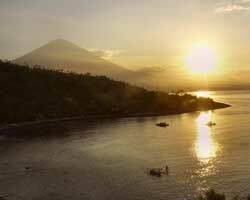 We can enjoy the breathtaking view of Mount Agung and the Indian Ocean as we cross an adventurous suspension bridge. A few animals are kept on the grounds and a local restaurant offers basic dishes. 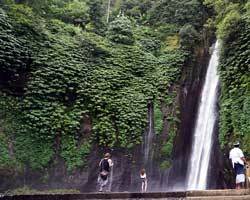 After a journey of 45 minutes towards the North of Bali, we reach a little known waterfall. A short trekking tour is necessary to reach it. The waterfall is not big, and a refreshing natural shower is possible. We find various crops like cocoa, pineapple or vanilla during the short trek through the jungle, which are cultivated there by the Balinese people. Tirta Gangga is a water palace built by the last king of Amplapura. Large pools filled with clear spring water and a traditional design provide a unique atmosphere. The complex invites you for a brief relaxing walk and offers good photo opportunities.One of the pools is used as a public swimming pool and the cold spring water guarantees a refreshing cooling off from the tropical temperatures. A restaurant in the complex offers high quality food and drinks. The journey time is 30 to 40 minutes. You can experience a romantic sunset in good weather conditions in the bay of Jemeluk in Amed.The drive takes 20 to 30 minutes by car from Tulamben. A rock ledge juts high over the bay and reveals the view of the volcano Agung. A restaurant offers cool drinks there. 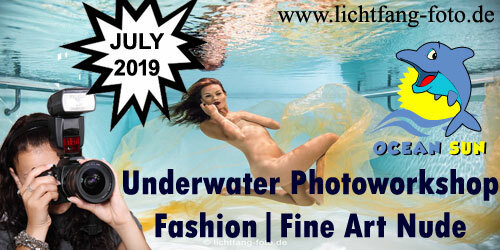 At the right time, you can witness a fascinating spectacle of nature there. 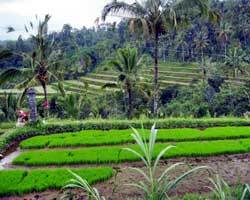 Local guides offer tours through rice paddies and Bali’s natural surroundings at Tiarta Gangga. The spring water in the area comes from the volcano Agung. A sophisticated irrigation system provides the plateaus with the precious water. The tour leads you directly through the terraces of the rice fields. At some places, there is a view over the rice terraces to the Indian Ocean. The journey time is 30 to 40 minutes. This tour can be perfectly combined with a visit to the Water Palace. 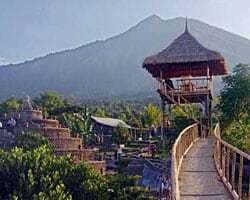 Originally the temple Pura Batur and the associated village Batur were located in the caldera of Mount Batur at the foot inside the actual volcanic crater. One of the eruptions destroyed the village and the temple in 1926. Traces of this and following eruptions can still be seen today. The villagers then moved to the highest point of the actual Batur Caldera and rebuilt the village and the temple there. Pura Ulun Danu Batur is one of the nine holiest temples in Bali, eight of which are arranged around the mother temple Pura Besakih. It offers a fantastic insight into the Balinese temple world. The journey time is two hours. 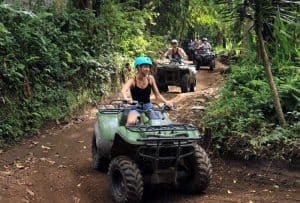 Get ready to get dusty and muddy as you drive through various off-road tracks of Bali! The quad & buggy adventure takes you through rice fields, plantations, jungles and traditional villages! Quads are automatic and easy to use. You can drive yourself or drive as a passenger. All tours are accompanied by experienced guides. We work together with the company “Bali Quad Discovery Tour” which offers other activities like tubing or monkey bike. 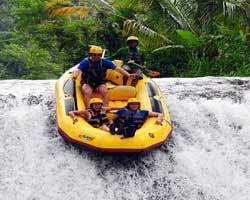 The rafting tour leads through the almost untouched jungle of Bali. The journey takes 90 minutes by car from Tulamben. Armed with a helmet, life jacket and paddle , you can face the pitfalls of the river.The two-hour rafting tour is suitable for anyone who can swim. The length of the tour is fifteen kilometers and there are some rapids to master. There is a break at a waterfall. This place provides a perfect background for your holiday photo. Showers are ready at the tour and a Balinese buffet awaits you in a restaurant. Pura Besakih is the most significant and largest, but not necessarily the most beautiful, Hindu sanctuary in Indonesia. 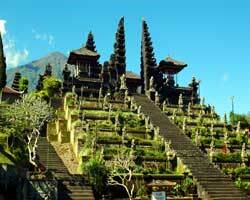 The “mother temple” of all Balinese temples was probably founded in the eighth century. 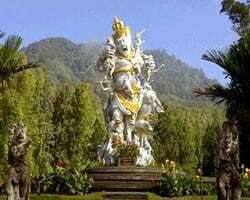 He is located at about 950 meters altitude on the southwestern slope of the volcano Agung. The complex consists of over 200 buildings, including multi-level temples, shrines and open pavilions. Each member of the royal family of Bali has their own shrine. All village communities have their own temple areas within the extensive grounds. The journey takes 90 minutes from Tulamben. 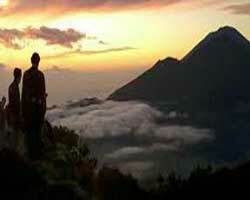 The volcano Batur is located in central Bali. The ascent starts in the early morning and lasts 2 hours. The goal is to watch the sunrise from the summit. The tour gives a good alternative for those who don’t want to face the more difficult mountain ascent of the larger Agung. It can get cold on the summit. Good footwear and warm clothes are strongly recommended. This trekking tour can be perfectly combined with a sightseeing tour on the way back to Tulamben. The Pura Ulun Danu Bratan is a unique temple complex that unites Hindu and Buddhist elements. Followers of both religions use this holy place. The temple was built in the 17th century on the southwestern shore of the crater lake. Known is the temple complex for the buildings, which were built on two offshore islets. The larger part of the complex is located on the lake shore. The temple is dedicated to the deities Shiwa, Brahma and Wisnu, making it one of the most important on the island of Bali. Near Bedugul is the botanical garden “Kebun Raya Eka Karya”. Here you can discover hundreds of different types of palm trees, cacti, orchids and bamboo species. We have to explore the park by car, which spoils the charm of the area. There are several theme gardens in the park. For active athletes there is a Treetop Park in the botanical garden. For the climbing course through the treetops, we have to pay extra. This climbing park is located in the botanical garden in the Bedugul area. It is possible to climb between the trees during 72 different challenges with various levels of difficulty. Floating bridges, spider webs, Tarzan jumps, flying fox, flying swings and many more surprises wait for you. 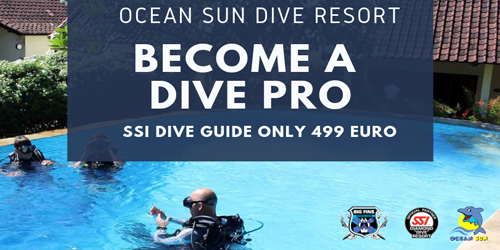 The equipment and introduction by instructors in a small exercise tour ensure safe fun. So you learn how and where you have to secure yourself to avoid crashes. Afterwards, the park can be used at will. A fun for young and old. The market of Candikuning offers the agricultural products of the mountainous area of the island of Bali. 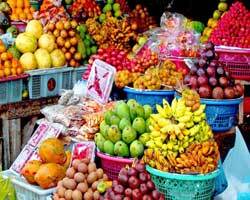 Exotic fruits like Salak, Rambutan, Sirsak, Durian and Mangosten are sold here. Also for Bali rare strawberries as well as many vegetables and countless spices can be found on the stands. 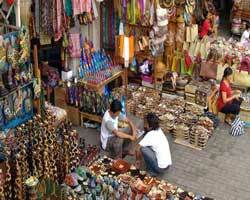 The traditional Bedugul market is very popular with tourists, as there are also many handcrafted souvenirs on offer. The Monkey Forest in Ubud is a must for many travelers!The monkeys are used to humans here because they are fed by guests. But be careful! They may try to steal everything that is unwatched or hanging from your pockets. They also become aggressive if they really want something. Do not miss the Dragon Bridge during a walk through the Monkey Forest. At its foot, you will find a sacred spring. 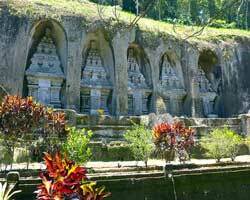 In the national language, the royal tombs are called Pura Gunung Kawi. These royal tombs were created in the eleventh century and are considered an exceptional cultural asset of the island. You reach the tombs in a deep ravine over a stone staircase cut in rock with more than 270 steps. The stairs are now lined with a number of tourist stalls. In steep cliffs, meters high tombs were struck and statue swatch over the surrounding land. According to a legend, a giant has scratched this gigantic monument out of the rocks with his fingernail in a sweaty night. Especially in the early morning, when few tourists have climbed down the many steps to the temple, this place has something magical. By contrast, it can get very crowded during the day. One of Bali’s highlights are the colorful traditional dances of the Balinese people. Dance performances are shown every evening in Ubud in several temples. Especially amazing are the performances at the Ubud Palace. 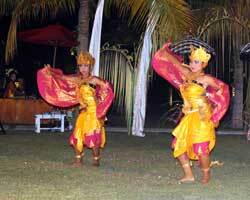 The best-known dances are the kecak dance and the legong dance. Each dance tells a story from Balinese mythology. The dances are musically accompanied by a Balinese gamelan orchestra. The two-storey building, known as Pasar Seni (Art Market), houses a huge selection of sarongs, dresses, shoes and souvenirs.The quality varies a lot and negotiates is indispensable. “Just looking” normally ends in a true spending frenzy. The dealers know how to sell their goods. To avoid the crowds, it is advisable to visit early in the morning or late in the afternoon. 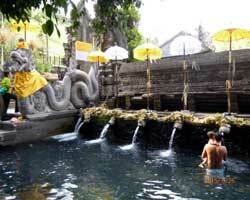 Pura Tirta Empul are sacred springs and a major sanctuary in Bali. 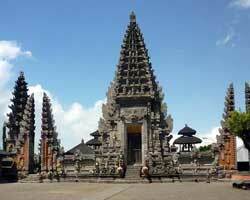 This sacred site is one of the most important places of pilgrimage for devout Hindu Balinese. 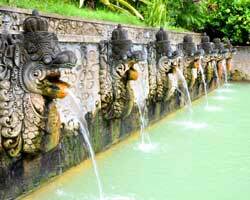 The sacred spring in Pura Tirta Empul is source fed by one of the surrounding volcanoes. It carries water even in arid conditions. The holy water is bottled in the Pura Tirta Empul and sold. As usual at most of Bali’s major attractions, the Pura Tirta Empul has plenty of souvenir stalls. In addition to sarongs and other textiles masks, bags and wickerwork are offered here. Although elephants were never native to Bali, you will find an elephant cave in Bedulu. 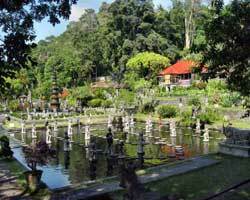 Starting from the parking area, we discover a beautiful complex with smaller Buddha statues and the temple Pura Taman. It is actually a spring sanctuary, which we can tell by the pools in front of the entrance to the cave. Welcomed by from a demonic stone figure, your path leads you into a small and dark cave. 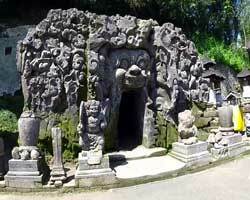 Inside the cave there are Hindu and Buddhist elements and you can discover various statues. The researchers still investigate this mixture today. Lovina Beach is the name of a series of beaches with a total length of twelve kilometers, located west of Singaraja. The small town is within easy reach of most of Bali’s natural and cultural attractions. The beaches of Lovina are among the fishing villages of Pemaron, Tukadmungga, Anturan, Kalibukbuk, Kaliasem and Temukus. 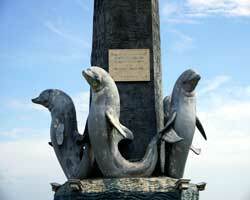 The beach of Lovina is especially known for dolphins, which visit the coast every morning at sunrise. Halfway between Singaraja and Seririt are the popular hot springs “Air Panas”. The pools are located in a beautiful tropical garden in the middle of the jungle. There are several pools, and the water has a pleasant temperature of 37 degrees Celsius. Another local attraction is the Buddhist monastery of Vihara, where we can find a miniature replica of the famous Borobudur Temple of Java. 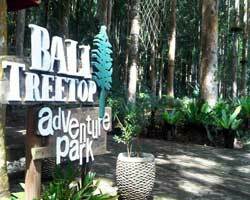 The Bali Barat Park is mountainous and consists of monsoon forests, mangrove forests, lowland rainforests, savannas, coral reefs and sandy beaches. Since the park is a nature reserve, accessibility is subject to a zone system that regulates the level of permitted activity. If you want to explore the park, you need to hire an official park guide. The park has over 175 plant species, 14 of which are endangered like Cendana or Sandalwood. 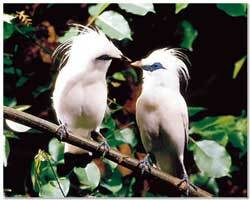 With around 160 different bird species, the Bali Barat National Park is a birdwatcher’s paradise.